通过磁力抑制当使基板与掩模彼此紧密接触时导致的基板与掩模之间的位置位移。 When the substrate is suppressed by a magnetic force to the mask closely cause positional displacement between the substrate and the mask in contact with each other. 在通过气相沉积穿过掩模(3)在基板(2)上形成包括在有机发光显示装置中的有机化合物层(有机EL元件膜)的步骤中，使基板(2)与掩模(3)对准，然后通过多个按压部件(5)将基板(2)按压到掩模(3)以执行临时固定。 By vapor deposition through a mask (3) is formed on a substrate (2) comprises the step of the organic compound layer device (organic EL element film) in the organic light emitting display, the substrate (2) and the mask (3) aligned, and then the substrate (2) is pressed by the plurality of pressing members (5) to the mask (3) to perform temporary fixing. 当通过临时固定抑制基板(2)与掩模(3)之间的位置位移时，通过磁体(6)使基板(2)与掩模(3)紧密接触。 When the position between the suppressed by the temporary fixing substrate (2) and the mask (3) is displaced by a magnet (6) of the substrate (2) and the mask (3) in close contact. 分别通过多个按压部件(5)临时固定已对准的基板(2)的多个位置，从而能够执行高精度图案化，以防止有机EL元件膜从阳极的偏离。 Respectively by the plurality of pressing members (5) a plurality of positions of the substrate (2) has been aligned temporary fixing, it is possible to perform highly accurate patterning, the organic EL element to prevent the film departing from the anode. 本发明涉及用于制备用于显示器等的具有高清晰度和大尺寸的诸如有机电致发光显示装置（有机EL显示装置）的有机发光显示装置的工艺。  The present invention relates to a display or the like, such as for the preparation of a high resolution and large-sized organic electroluminescent display device (organic EL display device) of the process of the organic light emitting display apparatus. 近年来，使用有机发光元件的平板显示器正在被关注。  In recent years, organic light emitting flat panel display device is being concerned. 特别地，使用有机电致发光元件（有机EL元件）的显示器具有能够执行低电压驱动与获得高速响应和宽视角的优点， 因此包括材料开发的装置应用研究已被积极地进行。 In particular, a display using an organic electroluminescent element (organic EL element) has a low-voltage driving can be performed to advantage with a wide viewing angle and high speed response, including application of the material thus developed device has been actively conducted. 有机EL元件是利用使到达发光层的电子与空穴结合时产生的发光的载流子注入型表面发光装置。  The organic EL element using that reaches generated when electrons and holes combined in the emission layer of the light emitting surface of the carrier injection type light emitting device. 通过有机材料的选择获得各种发光颜色。 To obtain various emission colors by selecting an organic material. 在有机EL显示器中，当使用红、绿和蓝（R、G和B)三原色作为各像素发光的颜色时，实现了全色显示。  In the organic EL display, when the red, green and blue (R, G, and B) as three primary colors of light emission color of each pixel to achieve the full color display. 当前，在制备有机EL显示板的工艺中，正在开发用于实现全色显示的外围技术。 Currently, the process for preparing the organic EL display panel, the peripheral techniques are being developed for realizing full color display. 考虑到当前有机EL元件的装置特性，使用低分子EL材料的真空气相沉积在实践上被采用。  Considering the device characteristics of this organic EL element, low-molecular EL material is employed in a vacuum vapor deposition practice. 特别地，为了实现全色显示，用于通过使用掩模（气相沉积掩模）的气相沉积来选择性地使R、G和B的各发光像素图案化的工艺被采用。 In particular, in order to achieve full color display, by using a mask (mask vapor deposition) vapor deposition to selectively R, each of the pixels of the patterning process G, and B is employed. 图8示出通过真空气相沉积进行的有机EL显示器的图案化气相沉积步骤。  FIG. 8 shows a vapor deposition step of patterning an organic EL display is carried out by vacuum vapor deposition. 放置在真空腔（真空气相沉积腔）中的基板102包括事先通过图案化形成的像素电极102a。 Placed in a vacuum chamber (a vacuum vapor deposition chamber) of the substrate 102 includes a pixel electrode formed in advance by patterning 102a. 基板102上的像素电极与掩模103的开口部分103a对准。 The pixel electrode 103 and the opening portion of the mask 102 is aligned on the substrate 103a. 在其中基板102与掩模103紧密接触的状态从气相沉积源104气相沉积材料，以在基板102上形成具有对应于掩模103开口图案的形状的有机薄膜（有机化合物层）。 In the state in which the substrate 102 in close contact with the mask 103 from vapor deposition source 104 vapor deposition material to form an organic thin film (organic compound layer) 103 having openings corresponding to the mask pattern shape on the substrate 102. 当要为R、G和B颜色像素中的每一个蒸发用于获得每个发光颜色的材料时，根据气相沉积材料将掩模与另一掩模交换。  To When R, G and B color pixels for obtaining each of the evaporation material of each emission color, according to the vapor deposition material mask and another mask exchange. 备选地，相对移动单个掩模的位置，从而实现分开的沉积。 Alternatively, the relative movement position of a single mask, thereby achieving a separate deposition. 当掩模变厚时，阴影（shadow)效应变得较大，从而存在难以获得具有期望尺寸的膜形成图案的情形。  When the thickened mask shadow (Shadow) effect becomes large, so that there is a case difficult to obtain a film having a pattern of a desired size is formed. 为了获得其中每个像素都具有期望的厚度和尺寸的膜形成状态，使掩模变薄是有效的。 The thickness and size in order to obtain a film in which each pixel is formed with a desired state, it is effective to thin the mask. 当掩模和基板之间的空间变得过大时，有可能使气相沉积膜插入所述空间中。 When the space between the mask and the substrate becomes too large, it is possible that the vapor-deposited film is inserted into the space. 当插入显著时，存在诸如发光颜色混合的缺陷的情形，其是由将发射一种颜色的光的材料插入相邻像素中发射不同颜色光的另一种材料中而引起的。 When another material is inserted significant defects such as color mixing light emitting case, which is to emit light of one color material into pixels emit light of different colors in adjacent caused. 因此，如日本专利申请公开No. 2005-158571中所公开的，在基板与掩模对准之后，必须动态按压（press)基板，以使掩模和基板彼此紧密接触。  Thus, as described in Japanese Patent Application Publication No. 2005-158571 as disclosed in, after the substrate and mask alignment, must be dynamically pressing (press) the substrate to the mask and the substrate in close contact with each other. 然而，在日本专利申请公开No. 2005-158571所公开的方法中，由于在不平掩模的凹入部分中导致的间隙，无法使基板和掩模彼此紧密接触。  However, in Japanese Patent Application Publication No. 2005-158571 discloses a method that, since the gaps caused by uneven in a recessed portion of the mask, the substrate and the mask can not be in close contact with each other. 从而，在气相沉积时发生插入。 Whereby, insertion occurs when the vapor deposition. 使用由磁性材料制成的掩模且通过磁力使掩模和基板彼此紧密接触的方法被广泛采用作为在基板和掩模之间获得紧密接触的方法。  using a mask made of magnetic material and the mask and the substrate by the magnetic force in close contact with each other methods are widely used as a method to obtain intimate contact between the substrate and the mask. 然而，根据本发明的发明人所进行的研究，在事先被彼此对准的基板和掩模彼此接触的状态期间，当使用磁体使掩模和基板彼此紧密接触时，发生基板和掩模彼此摩擦而损坏掩模和基板的现象。 However, according to studies by the inventors of the present invention is carried out, during the state prior to be aligned to each other the substrate and the mask in contact with each other, when the mask and the substrate using a magnet in close contact with each other, the occurrence of rubbing between the substrate and the mask phenomenon and damage of the mask and the substrate. 即，当使用磁体使基板和掩模彼此紧密接触时，需要在磁体引起紧密接触时抑制掩模和基板之间的位置位移的方法。 That is, when the mask and the substrate using a magnet in close contact with each other, it is necessary to cause a method of inhibiting positional displacement between the mask and the substrate in close contact in the magnet. 考虑到上述问题，为了在气相沉积步骤期间抑制基板和掩模之间的位置位移，完成了本发明。  In view of the above problems, in order to suppress the positional displacement between the mask and the substrate during the vapor-depositing step, completed the present invention. 因此，本发明的目的是提供制备有机发光显示装置的工艺，其能够有效制备具有高清晰度和大尺寸的显示板。 Accordingly, an object of the present invention is to provide a process of producing an organic light emitting display device, which is capable of efficiently producing the display panel having high definition and large size. 通过气相沉积穿过紧密固定的掩模在基板上形成有机化合物层。  tightly fixed through a mask by vapor deposition of the organic compound layer is formed on the substrate. 根据本发明，在基板和掩模之间的对准之后，通过按压部件的按压力临时固定基板和掩模，然后保持临时固定状态，通过磁力使基板和掩模彼此紧密接触。  According to the present invention, after the alignment between the substrate and the mask by the pressing force pressing the temporary fixing substrate and the mask member, and then holding the temporarily fixed state, the magnetic force by the substrate and the mask in close contact with each other. 因此，不发生基板和掩模之间的位置位移。 Accordingly, the positional displacement between the substrate and the mask does not occur. 作为结果，即使在大尺寸基板上也能够执行高清晰度的图案化。 As a result, patterning can be performed even on a high-resolution large-sized substrate. 本发明还提供一种用于制备有机发光显示装置的工艺，所述有机发光显示装置在提供在基板上的电极上具有至少一层有机化合物层，所述工艺包括如下步骤：通过对准机构将所述基板与掩模对准；通过多个按压部件将对准的基板从所述基板的中心部分向外围按压在所述掩模上，以临时将所述基板固定到所述掩模；通过磁化单元紧密固定被所述多个按压部件临时固定的所述基板与所述掩模；以及通过气相沉积穿过紧密固定的掩模在所述基板上形成有机化合物层。  The present invention also provides a process for preparing an organic light emitting display device, the organic light emitting display device having at least one organic compound on an electrode layer provided on a substrate, said process comprising the steps of: by the alignment mechanism aligning the mask and the substrate; a plurality of pressing members through the aligned substrate from the central portion to the periphery of the substrate is pressed against the mask to the substrate is temporarily fixed to the mask mold; tightly secured by the plurality of pressing members of the temporary fixing substrate and the mask by the magnetization unit; and an organic compound layer formed on the substrate through a mask tightly fixed by vapor deposition. 本发明还提供一种用于制备有机发光显示装置的设备，所述有机发光显示装置在提供在基板上的电极上具有至少一层有机化合物层，所述设备包括：用于将所述基板与掩模对准的对准机构；用于从所述基板的中心部分向外围将所述基板的多个位置按压到所述掩模以临时将所述基板固定到所述掩模的多个按压部件；用于通过磁力将所述基板紧密固定到所述掩模的磁化单元；以及用于通过气相沉积穿过所述掩模在所述基板上形成有机化合物层的气相沉积源。  The present invention further provides an apparatus for producing an organic light emitting display device, the organic light emitting display device having at least one organic compound on an electrode layer provided on a substrate, the apparatus comprising: means for the aligning said substrate with a mask alignment mechanism; from a plurality of positions for pressing the central portion of the substrate to the periphery of the substrate to the mask to the substrate is temporarily fixed to the mask a plurality of pressing members; for closely fixing the substrate by the magnetic force of the mask to the magnetization unit; and a vapor deposition source for the organic compound layer is formed on the substrate by vapor deposition through the mask. 图1是示出用于制备根据例子1的有机发光显示装置的设备的示意图。  FIG. 1 is a diagram showing an example for the preparation of an organic light emitting display device 1 of the apparatus. 图2是示出用于制备根据例子1的有机发光显示装置的步骤的示意图。  FIG. 2 is a schematic view illustrating the step apparatus for the preparation of Example 1. The organic light emitting display. 图3是示出用于制备根据例子1的有机发光显示装置的另一步骤的示意图。  FIG. 3 is a diagram showing another step for preparing apparatus 1 according to an example of the organic light emitting display. 图4是示出图1的设备中使用的掩模的示意图。  FIG. 4 is a diagram illustrating a mask used in an apparatus of FIG. 图5是示出图1的设备中使用的按压部件的示意图。  FIG. 5 is a schematic view illustrating an apparatus in the pressing member used. 图6是示出图1的设备中按压部件的布置的示意图。  FIG. 6 is a diagram showing the device arrangement of Figure 1 the pressing member. 图7是示出用于制备根据例子1的有机发光显示装置的步骤的流程图。  FIG. 7 is a flowchart showing the steps of the apparatus for the preparation of Example 1. The organic light emitting display. 图8是示出通过真空气相沉积进行的有机EL显示器的图案化气相沉积步骤的示意图。  FIG. 8 is a diagram showing a vapor deposition step of patterning an organic EL display is carried out by vacuum vapor deposition. 将参考附图描述用于实施本发明的示例性实施例。  A description of exemplary embodiments with reference to the accompanying drawings embodiments of the present invention. 真空腔1包括基板2、掩模3、真空沉积源4、按压部件5和磁体6。  The vacuum chamber 1 comprises a substrate 2, a mask 3, a vacuum deposition source 4, the pressing member 5 and the magnet 6. 如图1中所示，在真空腔1中提供基板2、掩模3和其保持机构。 As shown in Figure 1 , provided the substrate 2 in the vacuum chamber 1, the mask 3 and its holding mechanism. 真空腔1被维持在例如1 X IO-3Pa或更小的真空度。 The vacuum chamber 1 is maintained at e.g. 1 X IO-3Pa degree of vacuum or less. 在真空腔1中提供的气相沉积源4位于基板2之下。 Vapor deposition source provided in the vacuum chamber 14 located under the substrate 2. 基板2和气相沉积源4可以是位置固定的或者彼此相对移动。 Vapor deposition source 2 and the substrate 4 may be fixed relative to each other or positions. 用于使基板2和掩模3彼此紧密接触的腔可以与用于气相沉积的真空腔1分开，但是这些腔可以在真空状态下彼此连接。 2 for the substrate 3 and the mask in close contact with the cavity 1 can be separated from each other with a vacuum vapor deposition chamber, these chambers may be connected to each other in a vacuum state. 掩模3包括开口部分3a，且其形状具有薄板形状。  3 includes a mask opening portion 3a, and a shape having a thin plate shape. 为了实现更精细的图案，掩模部分的板厚度为IOOym或更小，更优选地为50μπι或更小。 In order to achieve a finer pattern, the plate thickness of the mask portion is IOOym or less, more preferably 50μπι or less. 磁性材料，例如，Ni-Co合金适于用作掩模材料。 Magnetic material, e.g., Ni-Co alloy suitable for use as the mask material. 通过蚀刻或者电铸（electroforming)形成开口。 The opening is formed by etching or electroforming (electroforming). 而且，用于大尺寸基板的掩模具有大的面积，从而难以实现开口尺寸的精确性。  Further, a mask for a large-sized substrate having a large area, making it difficult to achieve the accuracy of the size of the opening. 因此，合适地使用具有这样的结构的掩模，其中提供由不胀钢（Irwar)制成的高硬度框架部分（掩模框架），并且在由框架包围的区域中形成薄膜掩模。 Thus, suitably using a mask having such a structure, wherein a Invar (Irwar) high hardness frame portion (mask frame) made of a film mask and is formed in a region surrounded by the frame. 为了任何目的，可以使用硅基板、玻璃基板或者塑料基板作为基板2。  for any purpose, may be used a silicon substrate, a glass substrate or a plastic substrate as the substrate 2. 其中在无碱(non-alkali)玻璃上事先形成驱动器电路和像素电极的基板可以被用于显示器。 Wherein the alkali-free (non-alkali) substrate driving circuits and the pixel electrode is formed in advance on the glass may be used for the display. 在基板2 上提供用于与掩模3对准的对准标记。 Providing a mask alignment marks 3 and aligned on the substrate 2. 以下，将参考图7的流程图描述从在基板2和掩模3紧密接触的状态执行气相沉积的步骤到分离掩模3的步骤的工艺。  Hereinafter, with reference to the flowchart of FIG. 7 described process steps from step 3 mask vapor deposition was performed in a state where the substrate 3 and the mask 2 into close contact to the separation. 在步骤Si，将基板2和掩模3彼此对准。  In step Si, the substrate 2 and the mask 3 are aligned with each other. 如图1中所示，掩模3被维持在平坦保持状态。 As shown in FIG. 1, the mask 3 is maintained in the state held flat. 当掩模3和基板2彼此接近时，掩模3的开口与基板2上的像素对准。 When the mask 2 and the substrate 3 close to each other, the pixel on the substrate 2 with an opening 3 aligned with the mask. 这时，期望将基板2和掩模3维持在约100 μ m到500 μ m的间隔。 In this case, it is desirable to maintain the substrate 2 and the mask 3 at about 100 μ m to 500 μ m in the interval. 通过没有示出的对准机构调整形成在基板2和掩模3上的对准标记之间的位置关系而执行对准。 By alignment mechanism (not shown) formed in the alignment adjustment is performed on the substrate 2 and the mask 3 of the positional relationship between the alignment mark. 在步骤S2，使基板2与掩模3接触。  In step S2, the substrate 3 and the mask 2 in contact. 在步骤S3，执行对准确定。 In step S3, the alignment determination. 在完成对准之后， 使基板2与掩模3的上部接触。 After completion of the alignment, the upper substrate 2 and the mask 3 contact. 这时，基板2被从对准机构释放，然后通过其自身重力位于掩模3上。 In this case, the substrate 2 is released from the alignment means and positioned by its own weight on the mask 3. 当确定基板2和掩模3之间的位置位移为参考值或更大时，基板2和掩模3之间的状态再次返回到接近状态并且重复以上步骤。 When it is determined that the positional displacement between the substrate 2 and the mask 3 is the reference value or more, the state between the substrate 3 and the mask 2 is returned to the close state and repeats the above steps. 在步骤S4，通过按压部件5临时固定基板2和掩模3。  In step S4, the pressing member 5 by the temporary fixing substrate 3 and the mask 2. 如图2中所示，按压部件5 从掩模3的相反侧向下移动，以将基板2按压在掩模3上，从而执行临时固定。 As shown in FIG. 2, the pressing member 5 is moved from the opposite side of the mask 3 to the substrate 2 is pressed against the mask 3, thereby performing temporary fixation. 这时，可以基于基板2的尺寸和对准精度合适地选择按压部件5的数量。 At this time, the number 5 can be suitably selected based on the size of the pressing member and the alignment accuracy of the substrate 2. 可以合适地选择基板2被按压的位置，以便不导致基板2和掩模3之间的位移。 It can be suitably selected position pressed by the substrate 2, so as not to cause displacement between the substrate 2 and the mask 3. 更期望基于掩模3的强度和对准精度合适地选择按压位置和按压强度。 More suitably selected desired pressing position and the pressing intensity based on the intensity and the alignment accuracy of the mask 3. 对于所有按压部件5，用按压部件5按压基板2的时刻可以是相同的时间。  5 For all the pressing member, the pressing member 5 is pressed by the time the substrate 2 may be the same time. 为了抑制基板2和掩模3之间的位置位移，更期望从中心位置向外围位置按压基板2。 In order to suppress the positional displacement between the substrate 2 and the mask 3, it is more desirable from the center position of the substrate 2 is pressed to the peripheral position. 通过执行用于临时固定的步骤，保持其中通过按压部件5按压基板2和掩模3的状态，可抑制当通过磁力使掩模3和基板2彼此紧密接触时导致的位置位移。  By performing the step of temporarily fixed for maintaining a state wherein the pressing member 5 is pressed by the substrate 2 and the mask 3, the positional displacement can be suppressed when the substrate 2 and the mask 3 closely contact each other by the magnetic force caused when. 在步骤S5，基板2和掩模3实际上被充当磁化单元的磁体6固定。  At step S5, the substrate 2 and the mask 3 serving as actually magnetized magnet unit 6 is fixed. 图3示出在按压基板2和掩模3的同时向下移动磁体6以使基板2和掩模3彼此紧密接触的状态。 FIG. 3 shows a mobile while pressing the substrate 2 and the mask 3 downwardly magnet 6 and the mask 2 to the substrate 3 in close contact with each other. 永磁体或者电磁体可以被用作磁体6中的每一个。 Permanent magnet or electromagnet may be used as each of the magnets 6. 为了抑制来自气相沉积源4的热辐射的影响， 可以给磁体6提供用于冷却基板2的机构。 To reduce the influence of thermal radiation from the vapor deposition source 4, a magnet 6 may be provided means for cooling the substrate 2. 对于使基板2与磁体6接触的位置，特别期望覆盖掩模3的开口区域。 For the substrate 2 in contact with the magnet 6 position, in particular intended to cover the open area of ​​the mask 3. 在步骤S6，执行气相沉积。  In step S6, a vapor deposition. 当通过磁力使基板2和掩模3彼此紧密接触时，从气相沉积源4气相沉积有机化合物材料。 When the substrate 2 by a magnetic force and the mask 3 closely contact each other, the vapor deposition of organic material from the vapor deposition source 4. 这时，可以用按压部件5连续按压基板2。 In this case, the pressing member 5 pressed against the substrate 2 continuously. 作为备选的方案，可以从基板2分开按压部件5，从而只有磁力作用在其上。 As an alternative embodiment, the pressing member 5 may be separated from the substrate 2, so that only the magnetic force acting thereon. 在步骤S7，执行分离。  In step S7, the separation is performed. 在完成气相沉积步骤后，即使当为了释放基板2和掩模3之间的紧密接触状态而向上移动磁体6时，可能通过基板2和掩模3之间的位置位移而使它们彼此摩擦。 After completion of the vapor deposition step, in order to release even when the substrate 2 and the mask 3 into close contact state between the magnet 6 is moved upward, through the possible displacement between the position of the substrate 3 and the mask rubbing each other. 因此，在通过按压部件5按压基板2的同时向上移动磁体6是有效的。 Thus, while the upward movement of the magnet 5 is pressed by the pressing member 6 of the substrate 2 is valid. 在这个实施例中，基板的尺寸不是特别限定的。  In this embodiment, the size of the substrate is not particularly limited. 然而，当特别使用具有300mm或更大边长的大尺寸基板时，从对准结果获得与掩模的紧密接触状态是特别有效的。 However, especially when using a 300mm side length of the larger or large-sized substrate, in close contact with the mask obtained it is particularly effective from the alignment results. 当基于基板的尺寸和其形状最优化按压部件的布置、形状、按压强度时，能够在临时固定时以及实际固定时中的每一个都显著地抑制基板和掩模之间的位置位移。 When optimizing the pressing member is arranged, based on the shape and size of the substrate shape, the pressing strength, and can be displaced positions each significantly inhibited between the substrate and the mask fixed in the actual temporary fixing. 通过电铸制备图4中所示的200mm X 250mm方形（square)的掩模3。  FIG prepared by electroforming 200mm X 250mm square as shown in 4 (Square) 3 mask. 通过图1到3中所示的设备形成有机发光显示装置的有机化合物层。 The organic compound layer forming an organic light emitting device by the apparatus shown in Figures 1 to 3 display. 掩模3具有用于形成开口部分3a的由薄膜制成的结构与用于增加强度的掩模框架北。 North mask 3 having the mask frame structure for increasing the strength for forming a thin film made of the opening portion 3a. 掩模框架北由不胀钢制成，薄膜由Ni-Co合金材料制成。 The mask frame is made of invar north, a film made of an alloy material of Ni-Co. 掩模框架北的厚度被设为1mm，用于开口部分3a的薄膜的厚度被设为12μπι。 Northern thickness of the mask frame is set to 1mm, the thickness of the film for the opening portion 3a is set 12μπι. 对于薄膜，布置16个表面区域，每一个表面区域充当30mmX 40mm的开口部分3a。 For thin films, the surface area 16 is arranged, serving as an opening area of ​​each surface 30mmX 40mm portion 3a. 在每一个区域中，重复地提供尺寸为40 μ mX 120 μ m的开口图案，以制造德耳塔(delta)布置。 In each region, repeatedly providing a size 40 μ mX 120 μ m opening pattern, to produce a delta (delta) arrangement. 将掩模3的开口率（aperture ratio)设为1/3。 The mask 3 of the opening ratio (aperture ratio) is set to 1/3. 在对角线位置提供两个对准标记3c。 3c provide alignment marks at two diagonal positions. 将具有充当支承区域的25mm外围部分的掩模3置于真空腔1中。 25mm mask having a peripheral portion serving as a support region 3 is placed in a vacuum chamber. 要被使用的按压部件5中的每一个都是图5中所示的结构，并且能够被弹簧机构按压。  The structure of the pressing member 5 to be used in each of which is shown in FIG. 5, and the spring means can be pressed. 对于按压部件5中的每一个，具有6mm的直径且从SUS303切取的杆5a、以及由聚四氟乙烯（polytetrafluoroethylene)制成的模制部分被附接到要与基板接触的顶端（tip) 部恥。 For each of the pressing member 5 having a diameter of 6mm and 5a, and a molded portion made of PTFE (polytetrafluoroethylene) is attached to the substrate in contact with the tip (Tip) portion cut out from the rod SUS303 shame. 顶端部恥被设计成具有球形形状。 Shame tip portion is designed to have a spherical shape. 如图6中所示，将按压部件5布置成能够在25个位置处从基板侧按压掩模3的掩模框架北中的交叉点与端部附近。 As shown in Figure  6, the pressing member 5 is arranged to be pressed against the mask near the intersection of the mask frame 3 in the north end portion side from the substrate 25 at a position. 调整按压部件5的位置，以使位于25个位置的按压部件5基本上同时按压基板。 Adjusting the position of the pressing member 5, so that the pressing member 25 is located in position 5 of pressing the substrate substantially simultaneously. 对于磁体6，在对应于掩模3的开口部分3a的16个位置处布置每个具有24mmX 36mm的尺寸和5mm的厚度的永磁体，以不干扰按压部件5。  For the magnet 6, the permanent magnets are arranged each having a size of 5mm 24mmX 36mm and a thickness of 16 at the position corresponding to the opening portion 3a 3 of the mask so as not to interfere with the pressing member 5. 在真空状态，操作对准机构以缩短基板2和掩模3之间的距离到ΙΟΟμπι。  In the vacuum state, the operation of the alignment mechanism 3 to shorten the distance between the substrate 2 and the mask to ΙΟΟμπι. 然后，在用CCD照相机监控提供在基板2上的对准标记（没有示出)和提供在掩模3上的对准标记3c的同时，通过对准机构移动基板，从而执行对准。 Then, the alignment mark provided (not shown) on the substrate 2 is provided with a CCD camera and the monitor on the mask alignment marks 3 3c while moving the substrate through the alignment mechanism, so as to perform the alignment. 在操作对准机构以使基板2与掩模3接触后，将按压部件5向下移动，以通过按压部件5将基板2按压在掩模3上。 In operation, the alignment mechanism to the substrate 2 and the mask 3 contact with the rear, the pressing member 5 is moved downward, the substrate 2 is pressed to the mask 3 by the pressing member 5. 然后，使所有的磁体6基本上同时与基板2接触，以产生基板2和掩模3之间的吸引（absorption)。  Then, the magnet 6 so that substantially all simultaneously contact with the substrate 2, the substrate 2 and the mask to produce a suction (absorption) between 3. 在磁体6、基板2和掩模3互相结合（integrate)时，通过真空气相沉积方法在2X KT4Pa的真空度条件下以每秒3埃的气相沉积速率气相沉积700埃厚度的用下面的化学式表示的Alq3(由Dojindo实验室制备）。 When the magnet 6, the substrate 2 and the mask 3 bonded to each other (integrate), by a vacuum vapor deposition method at a vapor deposition rate of 3 angstroms per second vapor-deposited in a thickness of 700 angstroms degree of vacuum of 2X KT4Pa represented by the following formula the Alq3 (manufactured by Dojindo laboratory). 在膜形成后，检查作为基板2上的有机化合物层的Alq3薄膜的形状。 After the film formation, as the shape inspection Alq3 thin organic compound layer on the substrate 2. 结果，所述形状的尺寸与掩模3的开口尺寸基本上相同， 因此没有观察到膜的插入。 As a result, the size and shape of the mask is substantially the same size of the opening 3, and therefore the film was not observed inserted. Alq3薄膜被适当地（adequately)定位在Cr阳极上。 Alq3 film is suitably (adequately) positioned on the anode Cr. 通过与例子1中相同的方法制备掩模，并将其放在真空腔中。 Preparation of  the mask by the same method as in Example 1, and placed in the vacuum chamber. 通过相同的方法制备基板，并将其引入真空腔中。 Preparing a substrate by the same method, and introduced into the vacuum chamber thereof. 如在例子1中，将按压部件布置成在25个位置处按压掩模的掩模框架中的交叉点与端部附近。 As in Example 1, the pressing member is arranged near the intersection of the mask frame 25 at a position of the mask and the pressing end portion. 这时，调整位于25个位置中的按压部件的设置位置， 使按压部件以从基板的中心部分到基板的端部的顺序被按压。 In this case, the position adjustment of the pressing member is provided located at 25 locations, in order to make the pressing member end portion from the central portion of the substrate to the substrate is pressed. 调整弹簧机构，以使施加到基板中心的按压力变得等于施加到面内基板外围的按压力。 Adjusting spring mechanism, so that the center of the substrate is applied to the pressing force becomes equal to the pressing force applied to the inner surface of the periphery of the substrate. 对于与例子1中相同的磁体，被布置在与掩模的开口部分对应的16个位置处，以如例子1中一样不干扰按压部件。  the same as in Example 1. The magnet 16 is disposed at a position corresponding to the opening portion of the mask, as in example 1 to the same do not interfere with the pressing member. 在真空状态，如例子1中一样执行对准。  In the vacuum state, as same as the example 1 to perform alignment. 操作对准机构以使基板与掩模的上部接触。 Operating the upper alignment mechanism to the substrate in contact with the mask. 那之后，向下移动按压部件以通过按压部件将基板按压在掩模上。 After that, the pressing member is moved downward pressing on the mask substrate by the pressing member. 然后，使所有的磁体基本上同时与基板接触，以产生基板和掩模之间的吸引。  Then, all the magnets contact with the substrate substantially simultaneously, to produce the attraction between the substrate and the mask. 在磁体、基板和掩模互相结合时，通过真空气相沉积方法在2X 10-4½的真空度条件下以每秒3 埃的气相沉积速率气相沉积700埃厚度的Alq3(由Dojindo实验室制备）。 When the magnets, bonded to each other the substrate and the mask, through vacuum vapor deposition method at a vapor deposition rate of 3 angstroms per second vapor-deposited in a thickness of 700 angstroms degree of vacuum of 2X 10-4½ Alq3 (manufactured by Dojindo Laboratories). 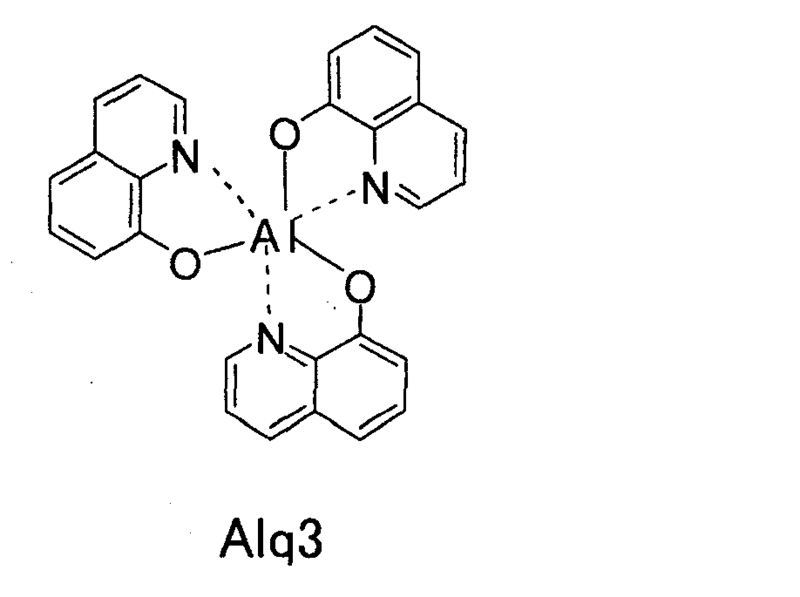 在膜形成后，检查基板上Alq3薄膜的形状。 After the film formation, the shape of the substrate inspection Alq3 film. 结果，所述形状的尺寸与掩模的开口尺寸基本上相同，因此没有观察到膜的插入。 As a result, the size and shape of the mask opening is substantially the same size, and therefore the film was not observed inserted. Alq3薄膜被适当地定位在Cr阳极上。 Alq3 film is properly positioned on the anode Cr. 通过与例子1中相同的方法制备掩模，并将其放在真空腔中。 Preparation of  the mask by the same method as in Example 1, and placed in the vacuum chamber. 也通过相同的方法制备基板，并将其引入真空腔中。 Substrate was also prepared by the same methods, and introduced into the vacuum chamber thereof. 如在例子1中，将按压部件布置成在25个位置处按压掩模框架中的交叉点与端部附近。  As in Example 1, the pressing member is arranged to press the mask near the intersection with the end frame 25 at a position. 这时，调整位于25个位置中的按压部件的设置位置，使按压部件以从基板的中心部分到基板的端部的顺序被按压。 In this case, the position adjustment of the pressing member is provided located at 25 locations, in order to make the pressing member end portion from the central portion of the substrate to the substrate is pressed. 调整弹簧机构，以使施加到基板中心的按压力变得等于施加到面内基板外围的按压力。 Adjusting spring mechanism, so that the center of the substrate is applied to the pressing force becomes equal to the pressing force applied to the inner surface of the periphery of the substrate. 对于磁体，在对应于掩模的开口部分的16个位置处布置每个具有4mmX 36mm的尺寸和20mm的厚度的永磁体，以不干扰按压部件。  For the magnet, the arrangement of each permanent magnet having a size 4mmX 36mm 20mm and a thickness of 16 at the position corresponding to the opening portion of the mask, so as not to interfere with the pressing member. 在磁体内提供水冷管以构建用于允许冷水通过水冷管的机构，从而冷却基板。 A magnetic body provided in the water cooling pipe to construct a mechanism for allowing the cold water through the cooling pipe, thereby cooling the substrate. 通过与例子1中相同的方法制备掩模，并将其放在真空腔中。 Preparation of  the mask by the same method as in Example 1, and placed in the vacuum chamber. 也通过相同的方法制备基板，并将其引入真空腔中。 Substrate was also prepared by the same methods, and introduced into the vacuum chamber thereof. 不提供按压部件。 The pressing member is not provided. 如例子1中一样布置磁体。 The arrangement of the magnets as in Example 1. 在真空状态，如例子1中一样执行对准。 In a vacuum state, such as the example 1 to perform alignment. 操作对准机构以使基板与掩模的上部接触。 Operating the upper alignment mechanism to the substrate in contact with the mask. 然后，使所有的磁体基本上同时与基板接触，以产生基板和掩模之间的吸引。  Then, all the magnets contact with the substrate substantially simultaneously, to produce the attraction between the substrate and the mask. 在磁体、基板和掩模互相结合时，通过真空气相沉积方法在2X 10-4½的真空度条件下以每秒3 埃的气相沉积速率气相沉积700埃厚度的Alq3(由Dojindo实验室制备）。 When the magnets, bonded to each other the substrate and the mask, through vacuum vapor deposition method at a vapor deposition rate of 3 angstroms per second vapor-deposited in a thickness of 700 angstroms degree of vacuum of 2X 10-4½ Alq3 (manufactured by Dojindo Laboratories). 在膜形成后，检查基板上Alq3薄膜的形状。 After the film formation, the shape of the substrate inspection Alq3 film. 结果，所述形状的尺寸与掩模的开口尺寸基本上相同，因此没有观察到膜的插入。 As a result, the size and shape of the mask opening is substantially the same size, and therefore the film was not observed inserted. 然而，Alq3薄膜从Cr阳极的上部偏离，因此没有适当地定位。 However, from the upper portion of the thin film of Alq3 Cr anode deviation therefore not properly positioned. 本申请要求2006年8月四日提交的日本专利申请No. 2006-231472的优先权，其所有内容在此通过引用被并入。  This application claims priority from Japanese Patent filed August 4, 2006 Application No. 2006-231472, the entire contents of which are hereby incorporated by reference. 1. 一种用于制备有机发光显示装置的工艺，所述有机发光显示装置在提供在基板上的电极上具有至少一层有机化合物层，所述工艺包括如下步骤：通过对准机构将所述基板与掩模对准；通过多个按压部件将对准的基板从所述基板的中心部分向外围按压在所述掩模上，以临时将所述基板固定到所述掩模；通过磁化单元紧密固定被所述多个按压部件临时固定的所述基板与所述掩模；以及通过气相沉积穿过紧密固定的掩模在所述基板上形成有机化合物层。 1. A process for preparing an organic light emitting display device, the organic light emitting display device having at least one organic compound on an electrode layer provided on a substrate, said process comprising the steps of: by the alignment mechanism the substrate and mask are aligned; the substrate by a plurality of pressing members press the periphery of the alignment from the central portion of the substrate on the mask to the substrate is temporarily fixed to the mask; magnetization unit firmly secured by the plurality of pressing members for temporarily fixing the substrate and the mask; and forming an organic compound layer on the substrate through a mask tightly fixed by vapor deposition. 2.根据权利要求1的用于制备有机发光显示装置的工艺，其中当所述基板被临时固定到所述掩模时，所述多个按压部件的按压时刻或按压强度在所述基板的表面上是不同的。 2. The process as claimed in claim 1 for the preparation of an organic light emitting display apparatus, wherein when the substrate is temporarily fixed to the mask, the plurality of pressing time or the pressing member presses the surface of the substrate in the intensity on is different. 3.根据权利要求1的用于制备有机发光显示装置的工艺，其中所述多个按压部件中的每一个包括杆和顶端部，并且所述顶端部具有球形形状。 According to claim 1 for the preparation process of an organic light emitting display device, wherein each of said plurality comprises a rod and a tip portion of the pressing member, and the tip portion has a spherical shape. 4. 一种用于制备有机发光显示装置的设备，所述有机发光显示装置在提供在基板上的电极上具有至少一层有机化合物层，所述设备包括：用于将所述基板与掩模对准的对准机构；用于从所述基板的中心部分向外围将所述基板的多个位置按压到所述掩模以临时将所述基板固定到所述掩模的多个按压部件；用于通过磁力将所述基板紧密固定到所述掩模的磁化单元；以及用于通过气相沉积穿过所述掩模在所述基板上形成有机化合物层的气相沉积源。 An apparatus for producing an organic light emitting display device, the organic light emitting display device having at least one organic compound on an electrode layer provided on a substrate, the apparatus comprising: means for the substrate and the mask aligning the alignment mechanism; a plurality of positions from a center to a peripheral portion of the substrate to the substrate is pressed onto the mask to the plurality of pressing members temporarily fixing the substrate to the mask; for closely fixing the substrate by a magnetic force to the mask, the magnetization unit; and a vapor deposition source of the organic compound layer formed on the substrate by vapor deposition through the mask. 5.根据权利要求4的用于制备有机发光显示装置的设备，其中所述磁化单元包含用于冷却所述基板的机构。 5. The apparatus for preparing apparatus 4 of the organic light emitting display device according to claim, wherein the magnetization unit comprises means for cooling the substrate. 6.根据权利要求4的用于制备有机发光显示装置的设备，其中所述多个按压部件中的每一个包括杆和顶端部，并且所述顶端部具有球形形状。 6. The apparatus as claimed in claim 4 for the preparation of an organic light emitting display device, wherein each of said plurality comprises a rod and a tip portion of the pressing member, and the tip portion has a spherical shape.